the Australian Institute of Interpreters and Translators. RADO Translations provide NAATI certified translations that are accepted in government and other official institutions across Australia and in the embassies of Ukraine and Russia. We offer tailor-made solutions for all your Ukrainian and Russian translating needs. We cater for individuals and for businesses and are focused on high quality language services,reasonable pricing and customer satisfaction. RADO Translations deliver legal, medical, business and personal document translation and assist with apostilles and notarisation. 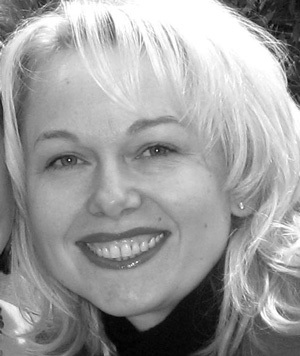 Olena Radievska is the founder and principal translator of RADO Translations. She is a professional translator and linguist. Olena graduated from Kyiv National Taras Shevchenko University (Kyiv, Ukraine) in 1993. Olena is accredited by NAATI (Australia) at the Professional Level in both Ukrainian and Russian languages and is also a professional member of the Australian Institute of Interpreters and Translators. Olena’s experience includes working as a full-time translator for national Ukrainian newspapers, global pharmaceutical company Boehringer Ingelheim and for European Commission TASIC projects, which involved international consultancy firms, European banks, and governmental and parliamentary institutions. Since 2005 Olena has been living and working in Melbourne, Australia, providing translation and language services to corporates, government and community organisations and individual clients. Over the course of 20 years, we have gained an extensive experience in translation. We specialize in two language pairs only, i.e. Ukrainian / English and Russian / English. Your document will be taken care of by a translator who is a native speaker of both Ukrainian and Russian and has undergone thorough professional training. RADO Translations commit to the highest quality translation for every customer. All our translations are done by NAATI accredited professional translators, which means they are accurate, fast and, most of all, accepted by any official body in Australia and overseas. The National Accreditation Authority for Translators and Interpreters (NAATI) is the national standards and accreditation body for translators and interpreters in Australia. NAATI credentialing provides quality assurance to the clients of translators. Quick turnaround is obviously of vital importance and RADO Translations take special care to ensure that all agreed deadlines are met. Standard turnaround time for most 1-page certificates is 2 business days. We deliver express translation if required. Your documents will be treated with the strictest confidentiality as we abide by the Code of Ethics of the Australian Institute of Interpreters and Translators. We provide Australia-wide services with our Head Office based in Melbourne. We provide translations to clients in VIC, TAS, WA, NSW, SA, NT, ACT and overseas. You can send us your documents via email, fax or by post from any location and we will organize delivery of your translation to your designated destination by whichever method you prefer. Reasonable pricing, no hidden costs and easy ways to pay. We offer you the best combination of reasonable pricing and high quality. Our rates are lower than agency fees, as you deal with the translator directly and we do not charge any intermediate fee. We accept payment via direct deposit, PayPal, cheque or in cash. The service provided by Olena was exceptional. The actual translation of our documents was very prompt and of high quality. Most importantly, she assigned to our documents helped guide us through the process of acquiring our first certified translation, and took the time to explain to us in laymen’s terms the steps involved. M.D., Medical Director of Boehringer Ingelheim Pharma GesmbH Representation in Ukraine. “Olena was responsible for implementing the project [targeting the Russian speaking community]. She was also responsible for developing information resources in Russian and English as well as coordinating information session addressing a range of crime prevention issues. In all my dealings with Olena I found her to be very professional and approachable.